Hotel Honeymoon Inn is located at the center of the famous Mall Road of Mussoorie - Queen of Hill Stations. Honeymoon Inn is best suited for couples and honeymooners but families can equally enjoy the facilities of this hotel. Besides being the perfect romantic getaway, Honeymoon Inn is also a wonderful family hotel. Honeymoon Inn is also ideal for short vacations and weekend getaways. The hotel offers picturesque views of the Doon valley. 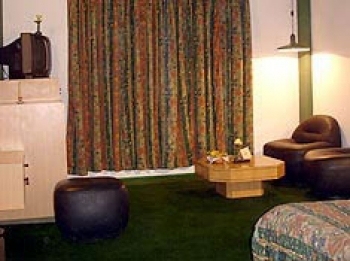 All the rooms have aesthetically done interiors with wall-to-wall carpeting and amenities like heating, television, channel music and 24 hour room service. Honeymoon Inn also offers special honeymoon packages specially for couples and honeymooners. The Honeymoon Inn Hotel in Mussoorie is located in the center of the famous Mall Road (near Library Chowk). Accommodation at Honeymoon Inn is categorized under Deluxe Room, Honeymoon Special Room and Super Deluxe Room. All rooms are thoughtfully designed with modern amenities to enhance your experience of togetherness and luxury. Deluxe Room: Deluxe Rooms are designed with atmosphere in mind. It boasts of fabulous views, personalized service and meals served in the room itself. However, if you wish, do come to our dining hall and relish the menu full of culinary delight. Honeymoon Special room: Luxury accommodation bound with a round double bed, a mirrored decor and every amenity that will make your holiday stay cozy and comfortable. Super Deluxe Room: Extra large rooms with central heating. Needless to mention every room at the Inn comes with attached baths, CCTV with satellite entertainment, Channel music, 24 hours Room service. Your every whim becomes our command. Hotel Honeymoon Inn offers a unique dining experience with variety of cuisines and beautiful views of the Himalayas. The dining hall has been completely redone to serve the guests with the best of food and drink. - Channel music, Convector heating, Travel counter, Room services, Car parking, Cable T.V. - V.A.T 5% on Food and 13.75% on Beverages. Private taxis are available for excursion tour and sightseeing places around Mussoorie from Delhi. The nearest Railway Station is at Dehradun, is 35 km from Mussoorie. You can take a taxi from Dehradun to Mussoorie, available at rate fixed by the Union. Dehradun Shatabdi, Dehradun Janshatabdi, Mussoorie Express are the IRCTC trains from Delhi to Dehradun. The nearest airport is Jolly Grant which is 45 Kms from hotel.